This year's hat and mittens for J have been a long time coming. I finished the hat so long ago I can't remember when he started wearing it. The mittens are hot off the needles. Yesterday, while walking home from coffee I realized J was wearing a picture worthy outfit, so we hurried home to document my triumph over procrastination. The body color is Paton's Classic Wool in Dark Gray Marl, that I impulse bought at A.C. Moore. The blue is also Paton's Classic Wool (Royal Blue, maybe?) from a few years ago, and the green is from my Wool of the Andes stash (Grass, I think). 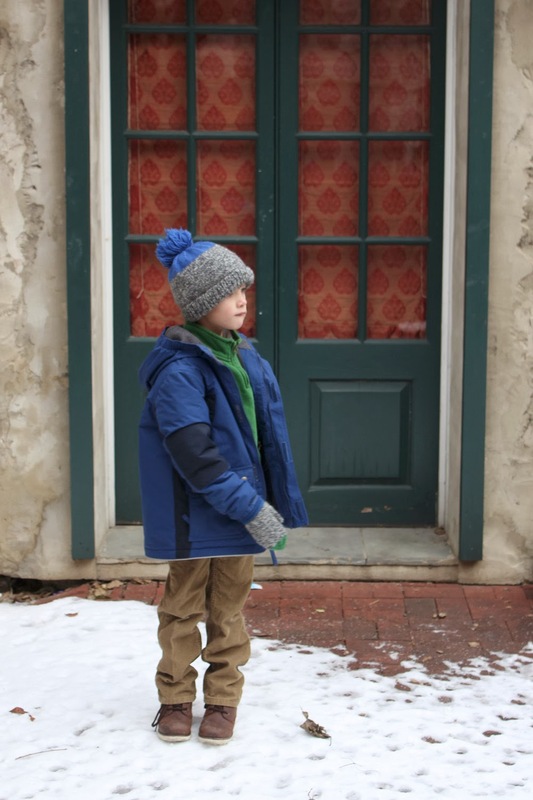 I fully intended to keep it simple this time around, and knit matching hat and mittens in solid Marl, for the understated sophistication befitting of an almost 7 year old. But somehow a few bright colors found their way onto the needles (as usual!). Both patterns are my own, and an expansion on the basics. The mittens are a soon to be added size for the Simple Ribbed Mitten pattern.